Spring is slowly arriving, so one of the first things I did was fire up the grill. Don’t get me wrong, if I want barbeque enough, I will shiver out there in the middle of the winter, with snow on the ground. But it’s much, much nicer when you don’t need to wear a coat. My favorite grilled food is still pork skewers, but chicken thighs are nice because I basically just use the same marinade. The marinade is based on a mixture of soy, ketchup and pineapple juice (in my other recipe, I talk about why I replaced the 7up with pineapple juice). I know not everyone is keen on ketchup, but I’m with Jamie Oliver here: the ketchup gives you that nice stick-to-your-ribs stickiness that caramelizes on the grill. (Of course, he was referring to the pig’s ribs, or what used to be the pig’s ribs.) One substitution I made to my previous recipe is instead of sugar, I used honey. This gave the marinade an extra stickiness. Make sure to use chicken thighs, or at least dark meat. I never grill chicken breasts — they dry out way too fast. 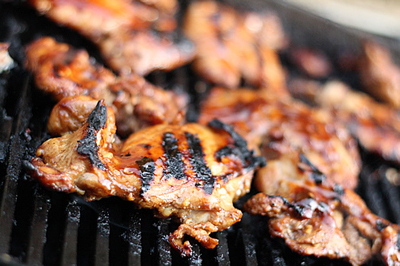 The chicken thighs stay really juicy and taste the best when grilled. 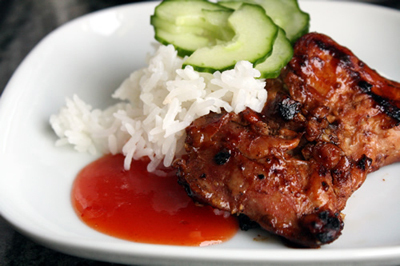 Serve with steamed rice, spicy duck sauce and cucumber pickle and it’ll feel like yer kickin it in the islands. Whisk together the ketchup, soy, pineapple juice, honey vinegar, sesame oil, salt and pepper. Set aside 1/4 cup for brushing on the chicken while you’re grilling. To the remaining mixture, add the minced garlic. About 5 hours before grilling, place the chicken in a large bowl or ziploc bag. Add the marinade and let sit in the refrigerator until you are ready to grill. Prepare the grill. Remove the chicken from the marinade (discard the marinade) and grill for 6-7 minutes each side, brushing with the reserved sauce before turning. Pineapple marinade sounds fabulous. I love that combination of savory and sweet. What perfect springtime, grill-worthy flavors. Can’t wait to try out your recipe! this looks really yummy – definitely one i will try – as soon as the wetter lets me! Oh my, this looks delicious! I’m going to try this tonight. But in the oven… It’s raining in England. What a surprise. PS Your photos are amazing, by the way! Great looking grilled chicken! How interesting to use pineapple marinade, I bet it tasted great! I love pineapple fried rice! I am with you on using thighs instead of breasts. So much more flavor, not to mention juicier. I’ve made this twice in as many weeks. Very easy and tasty. Not easy to do on an grill pan, though. The sugary marinade burns quickly and ends up making the house kinda smokey.